Holly Lodge School, Holy Lane, Smethwick, B67 7JG. 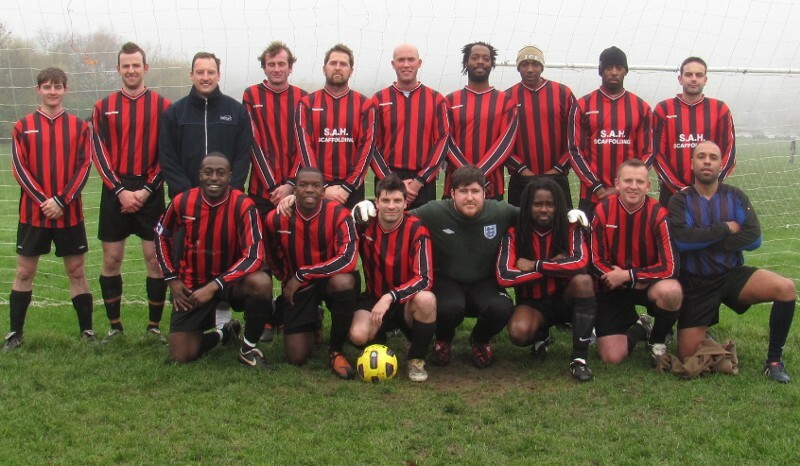 Rowley Regis College FC unsurprisingly began as a staff and student team. Officially constituted in the summer of 1991 we spent our first season in the Wolverhampton Amateur League, a bruising experience which brought us to the first of many ‘should we carry on?’ conversations. In our first ever match (which featured three, Bennett, Ibrahim and Inett who are still a part of the Rowley set-up) we were pitched against a team of talented Sikhs who promptly beat us 12-0 (I swear) though the ref only recorded 11 of them and then took us back to their club for free chips! Due to a quirk of fixtures we were also due to play them at home in our second match so the cavalry (no, not Calvary!) were called for (i.e. some big lads including Dale Smith’s brother who’d been at York City). We lost 3-2 but had at least found a way to compete. Sadly it was not a way that allowed the original ethos to flourish so on the advice of a couple of our original lads we applied to join the WMCFL in 1992. We were never a Christian-based team as such, nor ever pretended to be: we were a collection of Christians and (I suspect) heathens. We came in search of a better attitude to the game (less undirected aggression but certainly as much directed aggression) and pleasingly found it and have never regretted the decision we made. Our opening in the WMCFL was a little more promising. We lost 2-1 to West Brom (Devon, who was in those days a youthful 51 got one of the goals) but had much of the game, which boded well (we thought). It was in the days when the league split at Christmas (a strange but very effective decision) and like so many new teams we found ourselves largely losing for a good while and then discovering how to win. We finished up runners up in the second division, beating the first manifestation of Amblecote 2-1 in the last game of the season. The winner was scored by one of that era’s real characters: Richard O’Driscoll, known to all as Oz and hard enough to sport a ginger perm in the Black Country. That season also gave a debut to a gangly sixteen year old called Southall, but more of him later. We soon became the classic middle of the table team, beating with remorseless regularity the teams below us and losing with the same consistency to those above us. We often gave the big boys (Chawn, Walsall, Aldridge, Woodgate) a scare but almost always succumbed. We also always had good players: Saul Wallis, Simon Brownhill, Matty Dyer but we always looked what we were: a group of mates who turned up on a Saturday for a game of football. Our secret was, as I revealed a couple of weeks ago, we NEVER trained. For most of the better players we’ve had over the years this has proved the major attraction: we were a home for those who lacked that little bit of commitment. In 1992-1998 it was a constant source of frustration: when it successfully scooped up the Widdicombe twins (who preferred playing for us to training with someone much better) it became less of an issue. In the meantime we had at least got to three League Cup semi-finals and having lost to Alpha and Woodgate previously, in 1997 we overcame AFC Zion and went to a cup final. It was a marvellously managed event and a hugely enjoyable experience. What we lacked on the night was belief. We were massive underdogs and conceded a goal in the first few minutes to a powerful Aldridge side. However by five minutes to the end of extra time we were 4-3 up and only had to hold on! The less said the better about those last five minutes, save that we lost 5-4! After the final Dale Smith retired for the second time! Dale had played Amateur football for over twenty years before Rowley and had managed us in the first season before hanging up his boots. We coaxed him back in 1992 and again in 2000, when he played all through the cup run and into the final in 2001 which we won, beating City Athletic with a Tom Botfield goal. Dale was 43 and the final was his 156th start and he had scored 76 goals. There were two games left of the season for him to tie up his Rowley career with a goal every other game: dutifully he scored three in two to bring his stats to 158 (79). That should have been a pleasing end to ten years of commitment (including many games in midfield and even at the back) but there was to be a postscript. Halfway through our championship season we had to drag Dale away from his lawn because we were short and hence mess up his stats. In return I promised him a start in the last game of the season to try to put things back in balance. Amazingly he got a hat-trick against Solihull leaving him a couple of games grace if ever the smell of liniment gets too strong again. We actually enjoyed about three and a half seasons of beautiful football, where our confidence meant that every marginal decision and bounce of the ball seemed to go our way (a strange and lovely experience which has since been replaced by its antithesis). Central to this was the emergence of John and Pete Widdicombe who terrorised defences and encouraged our players to set and reach higher standards. Across that period John scored 69 goals in 71 starts and Pete 64 in 59 starts. We won the league winning 15 of our 18 matches and only losing one (to Chawn 1-0) and all this without a regular goalkeeper. With a back line commanded by Alun Inett (alongside Rowey, Cookie, the Hadley boys and young Staien), a powerful midfield of Southall, Botfield and captain Johnny Warr and two potent wide weapons in Sean Hall and Olly Staien the Widdicombes were the icing on the cake. Sadly it fell apart as quickly as it had emerged in the 2002-2003 season (my most disappointing) when we had every chance to win it again and threw it away. Two games stand out, both 3-4 reverses. First we turned up with half a team at bottom of the table Christchurch and lost despite a John Widdicombe hat-trick. Then with six games to go we faced our nemesis side (the reformed) Amblecote, who had even thrashed us 5-1 as a second division team when we were romping to the title the year before. We were at full strength and the game was a classic: we led 2-0 against the run of play, they equalised, we forged ahead in the second half but were pipped at the post by two late goals. This magnificent game literally burst our bubble of invincibility and somehow something changed. We had five games left and three wins would have been enough to take the title from Calvary but we struggled for players and lost three in a row. By then we had turned what should have been a title decider against Calvary into a game which was only important to them as they tried to hold off Amblecote’s late challenge. In fact it turned out to be that great Rowley team’s last throw of the dice since all of the absconders dutifully turned up and we beat Calvary in another great game 3-2. We have since spent three seasons trying to rekindle past glories and slipping further away from the pace. In simple terms we have failed to do what we used to do for fun: score goals (our top scorers in all competitions in the last three seasons scored 5, 9 and 7 respectively). This resulted last year in our first relegation. This was particularly hard as it followed on from the closing of Rowley College itself. Nevertheless we press on and it was possibly the relegation that ensured that we have. Fifteen years and 364 games have shown us the full range of emotions and experiences and that’s the beauty of it and it’s hard to give up.